I kind of wanted to do this for awhile , and perhaps I sort of already did. No wonder the Psychiatry can easily diagnose us with something. And I know from personal experience. I know I’m not alone when questioning neurology and the like. And that’s just my personality type alone. I didn’t even mention the fact that I’m a Transgender Lesbian Woman ! I become the minority of minorities. Did I mention my Twin Flame is an ESFP. Not a bad thing , perhaps it’s a balance sort of thing. One thing I remember reading was how INFPs have different needs when it comes to a social life. And perhaps a lot of Quinton’s articles are offensive to leftists. As well as his MBTI articles and blog videos. In recent years , and probably due to my spiritual awakening since meeting my Twin Flame in late 2015 / spring 2016 , I was guided to so much knowledge I didn’t know existed previously. And one of the things that I’ve noticed is how there’s so many like minded people which I can relate to strongly doing blog videos and such. The big question is , is this an INFP thing ? Is what I’m into INFP things or can this be truly beneficial to all human kind ? And I hear like minded light workers saying pretty much how I think and feel when times are down. So much knowledge that I can relate to. I truly think that the future of social lives would relate to the internet most certainly. If it’s FaceTime or Skype or Google Hangout or whatever is out there. Technology has succeeded in the Video Phone ! People can do it with their smart phone without paying a cent ! So of course the FCC wants to get rid of this freedom ! Of course capitalism wants to ruin it. But it’s always refreshing to hear likemindedness coming from someone who isn’t me ! So because INFPs are introverted as well as intuitives , perhaps INFPs can be the loneliest people ever. I highly doubt that it’s ISTPs because technically isn’t that the majority of masculine people , ( mostly men ). I have an ISFP friend and we’ve been friends since we were kids. As well as fun activities in general. To go out for coffee and have a nice intellectual conversation as well as cracking satirical jokes laughing at this capitalist hierarchical world we’re all trapped in. Sometimes I often wonder if INFPs are the most hated personality type. Most likely by the Christian Right ironically. I find it very interesting how there can be people who simply do not like us. Because pretty much everyone gets cyberbullied and trolled. The motivations of hateful people is fascinating because it’s ignorant , stupid , and quite dangerous indeed. Which is why we need ANTIFA ! I was doing some research last night , I’m talking about not going to bed until 5am , pulling an all nighter just reading about some theology regarding the duality battle of good vs evil and how there’s similarities within what I believe which is New Thought / New Age Spirituality . What Anarchists / Socialists / Lefties want to get rid of is hierarchy which is evil. Perhaps it can be called as immoral evil. Perhaps those minds of the psychopath are also creating all that stuff too ? Even dangerous animals like sharks ? There’s the psychology of evil of course. And it really does seem like evil wants to do whatever it can to defeat love. But what’s interesting is this. Then is Love simply the answer ? Hierarchy prevents us from so much good in this world. It’s really hard to tell who the evil villains of the world is because people live in fear. They can either be submissive or dominating. Just how can we get love to cure all the evil in the world ? Is Anarchism possible in our lifetime ? ( 1. Having this kind of meaning in life within my mission to bring love to people as a healer with my gifts and talents in the arts and knowledge. ( 2. Anarchist Society Post-Revolution / 5D Earth sounds good to me. If it exists , I would more there ASAP ! Perhaps like anyone , we are annoyed with jerks ruining our life and the lives of others. We are sick of seeing sadness and misery that never seems to go away ! We are tired and sick of seeing people lose their virginity to someone who took advantage of them , and many other things which result to good people committing suicide. One of the things about me is I just can’t simply enjoy life like a liberal. Seeing the good in Trump and what he says and does , and think happy thoughts of the police protecting me and UGH ! The truth is much more satisfying. I’m not saying I’m a negative skeptical cynical hypocritical two faced person by any means. However certain things bring me joy in life that would seem sort of weird to most I suppose. As an introvert , I tend to enjoy my own company. And perhaps I can become just as comfortable as I am alone when it comes to like minded people. But if I’m not with like minded people , I feel drained and prefer to be alone. A request for like minded people to be together. If there was a specific place we could all migrate , that would be nice , just get rid of the hierarchy. But of course the passport crap and hierarchy ruins it ! Life can seem like a confusing place. Most people just dismiss the mess of the world with an indifferent perspective and say “ That’s life , it is what it is , might as well make the best of it. “ on one hand , then you have all sorts of political ideologies which can clearly be matched to personality type. Today I’d like to examine some personality theories with you. Perhaps some questions for discussion. Now is it true that some personality types can be born this way while others might be the manifestation of authoritative upbringing as well as gens ? Are iNtuitives smarter than sensors ? Or is it just iNtuitives letting out steam for being minorities in a sensor majority world ? Is everyone secretly INFP ? Or is this a nightmare world for the INFP to work their Lightworker mission until their life on Earth is complete ? I have mentioned that perhaps there are a certain group of personality types or is INFP the closest to have their head in the clouds and the type to not have their feet on the ground so much as other types do ? And as an Anarchist , just what personality types are responsible for the hierarchical world we live in ? Is the whole “ iNtuitive Bias / Sensor Bias “ nothing more but hierarchy and oppression fighting against one another and the way to end it is to end hierarchy itself ? Currently I’ve been doing some research as well as every single day and night for 12 solid years and continuing working on my Twin Flame Union . One would be more material focused and the other would be more spiritually focused ( Me ). I mentioned that maybe perhaps my Twin Flame is a Sensor. Specifically an ESFP . I’m an INFP myself . What Cassady is referring to is known as The Twin Flame Mirror ! I highly recommend her Twin Flame videos too. 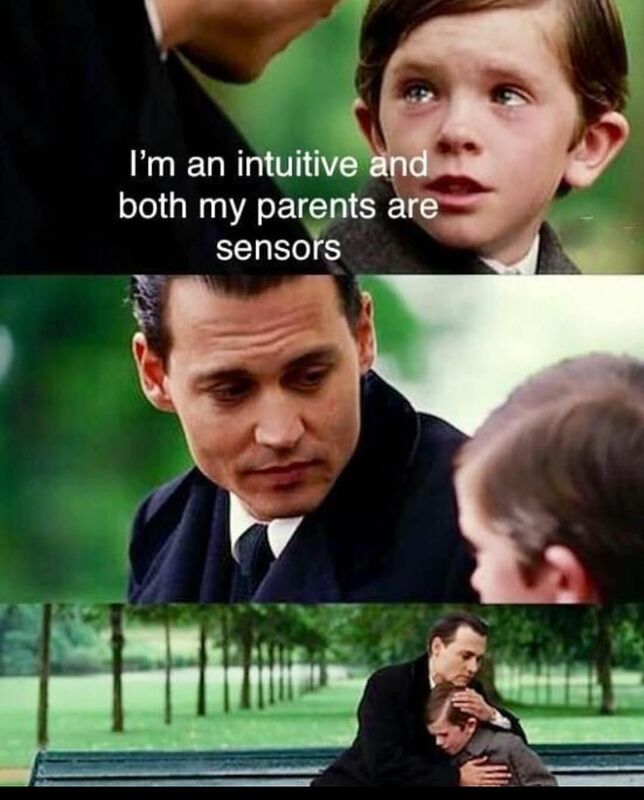 So is this related to iNtuitives vs Sensors ? Because you can relate to it on a deep level. Or maybe not laughed with it so much , but perhaps (hashtag ) METOO ! This is such an INFP meme ! But even Greg of in5D mentioned that some people would get left behind in a 5D Earth. So here’s a point I’d like to bring about. And let’s measure those types that are most closest and open minded to love and those that are not. Perhaps people look at love differently. So is Twin Flames a cheat sheet to turn an sensor into an iNtuitive ? Or maybe it’s just Good Ol’ LOVE POSION NUMER 9 ! HIT IT ! A one … a two .. a one , two , three , four ! Fellow Twin Flames , only if we could buy a bottle of love potion number 9 instead of getting ripped off my con-artists or real Twin Flame with overly expensive products such as $500 for some PDF files and mp3 meditations. Anyway let’s go onto the other half of a similar matter. Relating , one of the things that Cassady of Twin Flames 11:11 said that I thought was interesting was “ Hurt people , hurt people “ . And I’ve heard other similarities . Like “ Those who hurt others , hurt themselves. “ ( That one was from Jim Henson’s Tale of The Bunny Picnic ) . The reason why I wanted to talk about it was there’s those damn PragarU stinky fascist juck-juck videos disguised as adverts that keep getting popped up before Anarchist videos . Not as violent as the Alt-right vs Antifa but still . It’s a good thing I knocked the piss out of them earlier. Well , that’s the only thing Pragar got right ! FEARING THE LEFT ! Is it nothing more but authoritarian brainwashing ? Without all the info on personality types out there and I’ve done my share of research. What if you CAN’T separate them. So speaking of personality type and mirrors , are we fighting the duality mirror ? Again , does that prove that everyone is secretly INFP ? So , is that the purpose of life is for the INFP to inspire positively ?